An Arizona-based band that’s in the top-ten most-visited artists on the popular website MySpace is making one stop in Iowa next week. The Medic Droid is piloted by 23-year-olds Chris Donathon and Hector Bagnod, both simultaneously singing, playing guitars, synthesizers and computerized drums. For now, Donathon says they’re a duo, but he adds, "We’re looking into getting live members, maybe a drummer, but that’s probably it, just for more energy." He describes their sound as a combination of pop, techno and metal and attributes the growing global fanbase to MySpace and this nationwide tour: "Me and Hector, we just write music because we like writing music and wherever it takes us, that’s awesome." Donathon says they’re not targeting any particular audience. Speaking to Radio Iowa from his home in Phoenix, he says: "I appreciate anybody who listens to our music. Anybody can be into our music. I don’t have a specific crowd that I want to listen to our stuff. The more people that it can get out to, that’s even better." As for the band’s musical influences, Donathon points to 80s pop and new wave groups like Duran Duran, Depeche Mode and New Order and to a host of more underground punk bands. 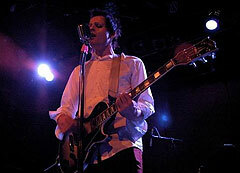 The band’s website is " www.myspace.com/themedicdroid ", where some of their songs have been downloaded by nearly three-million computer users around the world. The Medic Droid plays the House of Bricks in Des Moines Monday night.